Let’s talk Word of the Year! I’m sure you’ve heard about people choosing a word each year, kind of like a new year’s resolution. Some people know which word they want right away, and other people are unsure. I invite you to ask yourself these 3 questions to help you narrow down on your word for 2019, or to double check that the one you’ve picked is in alignment with what you are looking to create. 1) How do I want to FEEL this year? Write as many words that come to mind. 2) How do I want to ACT + PRESENT myself this year? 3) Which words from the above 2 questions INSPIRE + MOTIVATE me into action? Using these 3 prompts will help you choose a word that energetically aligns with you IN THIS MOMENT, instead of choosing a word you feel somewhat obligated to do. ​I know that we all get lost in the “shoulds” that we tell ourselves, which is why I want you to pick a word that feels good. When you’ve narrowed down your word, focus inward and see how your body reacts. Do you get butterflies? Do you feel excited? Is your body saying YES? These are all signs that you’re on the right track. This year, my word slowly made it’s appearance. I know that everything happens at the right time, so it seems only appropriate that my word for 2019 is “FLOW.” So, I’ll go along with the FLOW as everything unfolds in divine time, and I’ll remind myself to be grateful and enjoy the ride along the way. What’s your word? Let me know in the comments below! P.S. 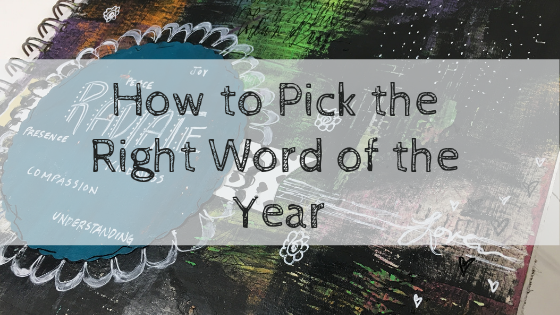 Here’s a free art project using your Word of the Year as the focus!